Junior guard Javon Gordon has sparked Delsea to South Jersey Group 3 title. People watch Javon Gordon on the basketball court and ask him about football. "All the time," Delsea's junior guard said with a smile. It's no wonder. Gordon looks like a Big Ten cornerback. He's a chiseled, 5-foot-9 athlete with strength and speed and spring-loaded legs. He looks as if he could do some damage for Delsea's perennially powerful football team and perhaps at the next level, as well. But Gordon is a basketball player, through and through. "I tell people all the time, I never really wanted to make time for football," Gordon said. "I love basketball too much." 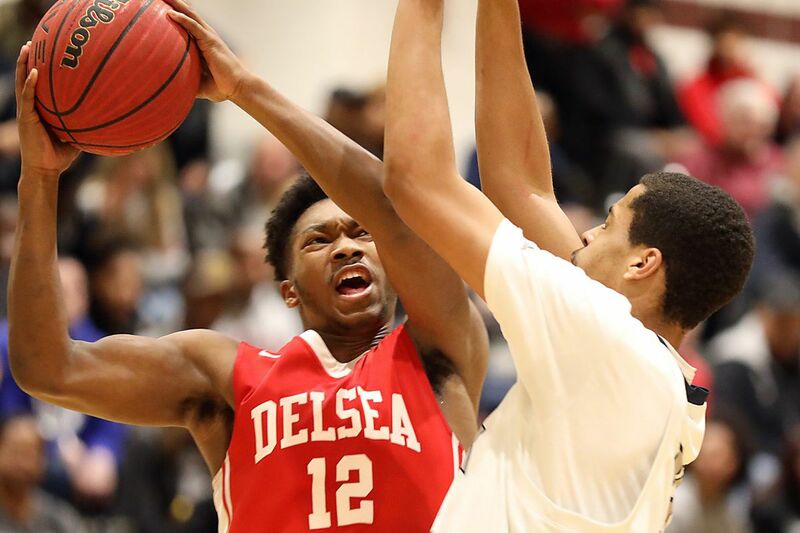 Gordon is the leading scorer for Delsea (25-5), the South Jersey Group 3 champion, which will face Central Jersey champion Nottingham (27-2) in Thursday night's state semifinals. Gordon averages 17.4 points. He also is the Crusaders' top three-point shooter (46) and shot blocker (23). That's some combination. He is second on the team in rebounds (132), assists (81) and steals (88). If anything, defense is Gordon's strong suit. Delsea’s Javon Gordon (right) guards Seneca’s Johnny Kennevan in SJ 3 title game. "Javon has been a do-everything guy for us," Delsea coach Tom Freeman said. "We have asked him to do so much. He has guarded point guards and harassed kids like [Woodbury's] Aaron Estrada and [Shawnee's] Dean Noll. "He's guarded bigger kids like [Highland's] Dante Masino and [Triton's] Jalen Collins. He's a tremendous defender with elite instincts." Gordon and 5-foot-9 senior point guard Kolby Braxton set the tone for the Crusaders with their diligence at the defensive end as well as their willingness to share the basketball on offense. The Crusaders specialize in the extra pass, with players skipping their own chance to take a good shot to set up their teammate with a better shot. "I know if I pass the ball, I'll be getting it back," Gordon said. "It's more about the win for me than anything else." Delsea’s Javon Gordon (right) and Nate Cox celebrate after win over Timber Creek in SJ 3 semifinals. Freeman calls the Crusaders the "most unselfish group of kids I've ever coached." Gordon is a leader in that category, too, since he's a dynamic athlete with the skills to create his own shot. He has scored 20 points or more in 12 games. He went for 31 in the playoff opener against Cherry Hill West, making five three-pointers. But like the rest of the Crusaders, Gordon usually is more focused on passing than shooting. "He is a great kid who is super-coachable," Freeman said. "No ego. Just buys in and plays the game the right way. "We tell him to be more selfish around the basket. He is always looking to make the right play." As were many of his teammates, Gordon was overwhelmed with excitement by Tuesday night's 53-40 victory over Seneca in the South Jersey Group 3 title game. Gordon and others took turns on teammates' shoulders, thrusting the championship trophy over their heads. "I can't describe how great I feel," Gordon said. "I wish it could happen all over again, the whole season, everything." Gordon said he played football from fifth to seventh grade. But he gave up the sport to focus on basketball just around the time he started playing in middle-school competition with current seniors such as Braxton, Nate Cox, Aziz Saud and Will Hawkins. "I wanted to give my all to basketball," Gordon said. Gordon said he watches Delsea football games and sometimes imagines himself on the field. "I feel like I could do something out there," Gordon said. "But in the back of my mind, I feel like I can do better things on the basketball court."